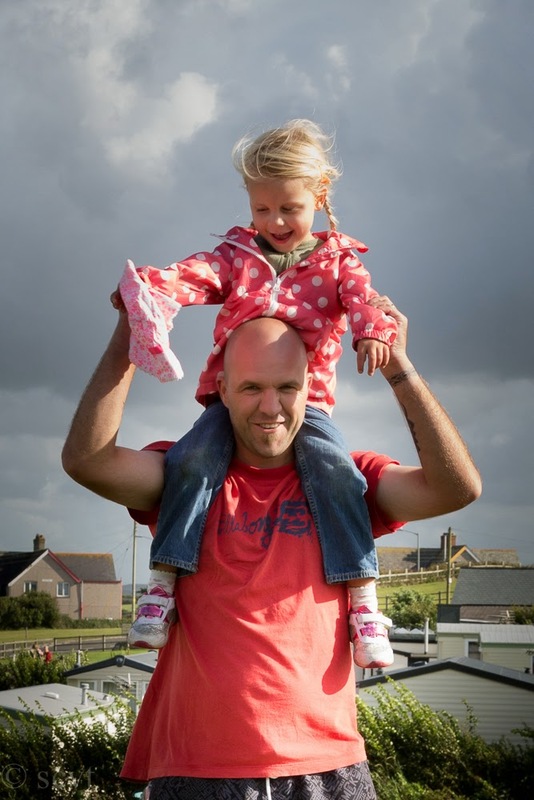 thoughtsfornaught | "Banana, nirvana, manyana"
When talking about supporting and rehoming refugees in our lovely little town of Bude, I’ve occasionally heard this question. To help answer it, here’s a nice little exercise. Simply work through the following scenarios until you have an answer. You are asleep in your bed, with your family around you. You awake suddenly to sound of breaking glass, and immediately afterwards, a heavy rock lands on your bed, between you and your partner. You run to edge of your window and look out to see two men throwing rocks at every window in the front of your house. You shout at them, they throw rocks at you instead. You decide to put and end to this by going outside with a cricket bat with which you hope to fight back. Dodging the rocks, you fight off your assailants. Do you decide to leave your house, or fix it up and stay? Will they come back tomorrow? You are asleep in your bed, with your family around you. You awake suddenly to sound of breaking glass and shouting. Sounds like every house in your street is under attack by men armed with rocks, perhaps the best thing to do is escape out the back, leading your family to safety at the bottom of the garden. You open the back door to be met by a shower of rocks. Grabbing your trusty cricket bat, you try to fight off your assailants, and somehow your bravado convinces the assailants to leave. Do you leave your house, or fix it up and stay, all the while hoping this doesn’t happen again? This time its men with hand guns. When seeking cover, your 4 year old daughter cuts her head open on some broken glass as she hides under a table. If only you were brave enough to fight back! Which scenario would make you decide to risk your family’s lives by fleeing to a place of safety? The majority of us in Britain have never suffered an armed conflict. We are de-sensitised by television, films and games. We have no idea what its like to have a rock through a window, let alone a gun pointed at us. Even the older generations in this country, those who remember The Blitz or the evacuation, can still ask this ridiculous question. Turn your back on tribalism, fascism, UKIP, Farage and Trump. Instead, face those who suffer, and give them what you can – even if its just a smile. You have no idea of the true horrors from which they seek refuge. This entry was posted in Blessings and tagged Bude Welcomes Refugees, Refugees on January 24, 2017 by Jase. Three Steps to Decide – In or Out? If you aren’t sure which way to vote in the forthcoming British referendum on whether Britain should withdraw from membership of what used to be called the European Economic Community, then follow this simple process to help you make up your mind. If you follow the advice here and come to a conclusion as a result, please leave a comment. I’d like to know if this piece helps you to make a decision. Is this problem caused by the public (a social / societal problem)? Is this problem caused by / a result of our government’s behaviour? Could the government realistically solve this problem? Would staying with the EU make these problems better, worse, or no change? Would leaving the EU make these problems better, worse, or no change? Are these problems caused by EU membership? In the event of an exit, will the effort and expense of untangling the nation from the EU help solve this problem? Similarly, in what way will spending time, money and effort building new partnerships with Europe and the rest of the world after throwing away the ones we had affect this problem? Figures in isolation are meaningless. For example, if we are spending 1 million per day on being part of Europe, this is a useless piece of information unless you can compare with something else: 1 million on Europe per day, 10 million per day on Trident, 100 million per day on the NHS. You should only gauge the value of the money spent in relation to other important spending. Furthermore, each side of the argument will be adept at massaging figures to emphasise a point. My figures here are illustrative and fictional. Ask yourself who stands to gain from the argument being offered? Is the position they are striving to achieve in your interest, or their own? Refugees are not the same as migrants. Refugees are seeking refuge. Usually from war, persecution or natural disaster. They aren’t out to get you. Migrants are fleeing poverty or seeking a better life for themselves and their children. They aren’t out to get you. I’d love to read your comments, conclusions, top 10 problems. This entry was posted in Miscellany and tagged brexit, britain, europe, politics, referendum on March 16, 2016 by Jase. at work, i’ve met a lady who is giving up drinking for a month. I am giving up my hair, and so is my partner Adele. i know someone else who gave up social media for a bit. What’s the link? Cancer. Nasty word. statistics are often quoted – one in three people’s lives will be somehow affected by cancer – that sort of thing. So far, I’ve counted 7 people. The good news is that beating cancer seems more and more likely. to this end, Adele and I will be shaving our heads in October to raise money. We may even dye our hair crazy colours first to draw more attention. If you’d like to support us raising money for Cancer Research, then please donate via our Just Giving page. most of us are blessed with our health, so much so we’ll probably never know much better off we are than someone who is suffering significantly. i find it helpful to remember this, and it helps me to stop wasting my health on excessive drinking, smoking, eating and couch surfing. I now perform 20 press-ups and 40+ seconds of plank prior to each shower i take. doesn’t sound like much, but that’s going from zero press-ups per week to 140 per week. My arms and shoulders feel bigger, burn more calories and allowed to me to effortlessly help an elderly couple with a bag of gravel yesterday. My back feel stronger, my stomach flatter and even a seven and half hour drive didn’t mangle my back too much. I am trying to preserve my health, not squander it. It’s never too late to rage against ageing, and as I cover my bald head with my Dad’s hat, I’ll remember all the people I know who lost and won battles with cancer. Please give money, pray, help someone and perhaps add one press-up per day until you feel meaty of limb! This entry was posted in Blessings and tagged blessings, cancer, fitness, health, just giving on September 3, 2015 by Jase. Read about some of our tutors here, and make your bookings here. Places are limited. We are all born with an innate capacity to project our voices and communicate every nuance of emotion . Music is at the core of our culture and as human beings we are in possession of a unique and expressive instrument. All birds can sing and human beings are no different. Singing is wonderful therapy and it can also be one of the most moving and important art forms as well as holding an important role in many spiritual practices around the world and throughout history. Occasionally we lose touch with this intrinsic ability and feel for various reasons we cannot sing as well as we’d like. There can be a real yearning to re-discover our voice, and to do so can be a great joy. It may take time and patience, but along the way there will be many glimpses of the great gift that is one’s own unique vocal instrument. It’s extremely rare to be ‘tone deaf’ . We all learn to speak through mimicry and can communicate with subtle nuances of pitch-but often through formative experiences we can become nervous of singing with the degree of physical commitment needed for correct tuning. ‘Singing in’ a song is an extremely important first step for all professional singers, where the simple process of repetition creates a muscular memory of the tune within the body, in the same way that dancers learn choreography. This entry was posted in Macaw, Martial Arts and tagged Adele West, Hermione Swinford, Jane Masterman, Lynne Holehouse, MACAW 2015 on July 13, 2015 by Jase. Now with Liam’s syallbus added. 6 martial arts sessions per day, what more could you want? Click the image, zoom in with the mousewheel…. This entry was posted in Macaw, Martial Arts and tagged Liam Grange, MACAW 2015 on March 24, 2015 by Jase. 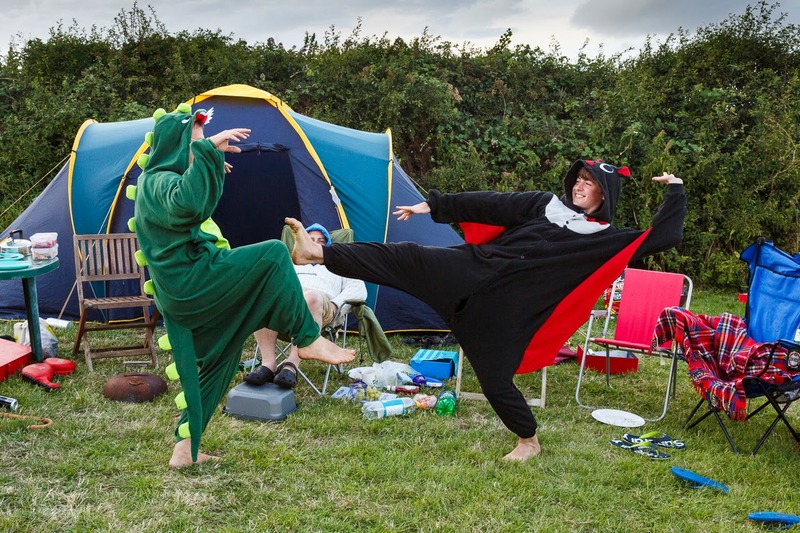 Martial arts summer camp is dead….long live MACAW! Ok, so camp isn’t dead, but its name is changing to be more in line with our broader vision – a martial and creative arts workshop, MACAW. When? Saturday August 1st – August 8th. Formal training starts Monday 3rd August. Where? Upper Lynstone Camping park, Bude. See here. Camping and static caravans, though may stay wherever you like. You must book this yourself. How much? You must pay for your own accommodation. Most students stay at the campsite. Martial arts training is paid for by student donation using a red envelope system (see below). Creative arts such as painting and pottery are paid for in advance through an online booking system here. How do I book? Book your accommodation directly with the campsite or wherever you choose to stay. Book your creative art lessons in advance through the site. 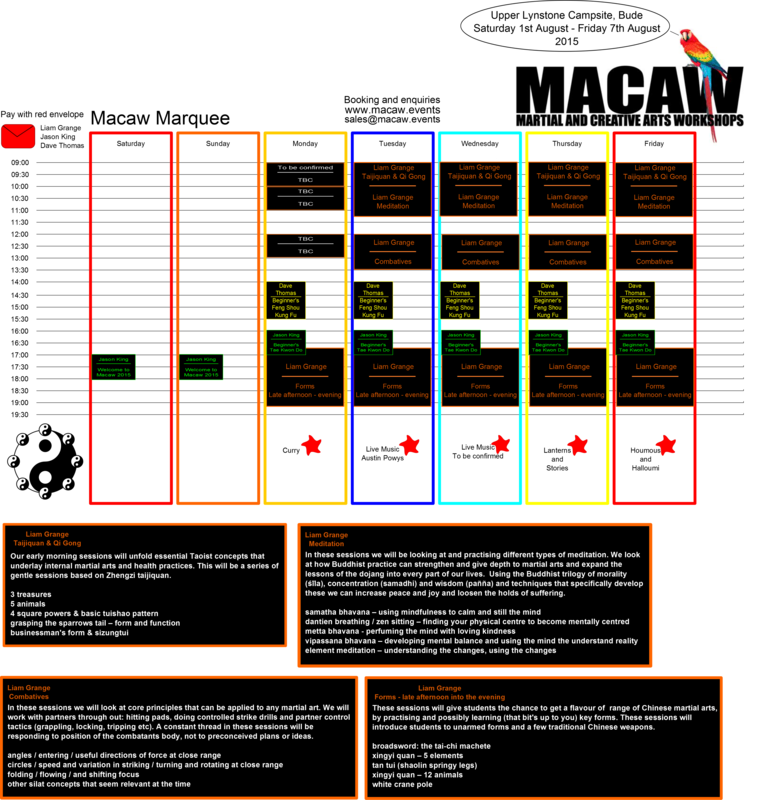 Martial arts training does not require advanced booking, but as a courtesy, please do let us know if you are planning to attend MACAW (contact form at bottom of page). This year sees a return of our tireless director of martial arts, Mr Liam Grange, bringing his melange of skills to the martially inclined. We’ve listened to feedback and observed the last five years activities, and this year we are moving towards a more formal programme of events. We are joined by a new friend Mr David Thomas, who will be teaching a beginner’s course of Feng Shou kung-fu in the early afternoon, Monday to Friday. Having trained with David, I can tell that you if you’ve only eight years of martial arts under your belt, then there is still plenty to learn from David. This will be followed by a beginner’s taekwondo session taught by Mr Jason King. By formalising a schedule and catering to beginners, we hope to open the camp to complete beginners and anyone else who may be a bit shy, or wanting a time-table to work from. Other guest instructors are yet to be announced and confirmed, but we are anticipating the return of Mr Alex Grange, who ran such an excellent taekkyon course last year, and all our old friends will be made welcome as usual. This year we have another marquee available (thanks Chris!) that will be dedicated to the creative arts – we see the return of fabulous Lynne Holehouse from the local Seventh Wave Gallery with three new art lessons – Hawker’s Hut in water-colour, Summerleaze Bay in acrylics and sand, and your family tree in your finger-prints. Last year, Lynne’s Chinese water-colour workshop was oversubscribed and produced some beautiful work (here). If you wish to attend any of these lessons, you must book in advance as places are limited. Each session is £19, but there is a discount if you book all three. Book here for these activities and all other prepaid events. Also returning this year is the lovely Jane Masterman, not only as a student but as a teacher too. Jane will be booking raku pottery sessions, final details to be confirmed shortly. BEFORE – Singer song-writer Hannah Power. This year we are opening the Parakeet Marquee for acoustic sessions to visiting and local musicians. All students are encouraged to come and show their musical or dance talents. This year Dragon Taekwondo’s Hannah Power will be singing for us. Hannah has a wonderful voice, not to be missed. Local band Austin Powys will be on-hand for at least one performance, accompanied by camp long-timer Alex King, and The MACAW team is busy negotiating another local band to play, so watch the Facebook page for updates. This year we are lucky to have Mrs Lisa Southard, founder of BlackBeltBooks and local ITF Taekwondo instructor performing an evening reading from a selection of her two published books – Tales From the Tenets, and The Time Travelling TKD Tour Bus and Other Stories, both of which are available on Amazon. Curry will be devoured again this year. Book yours now here. 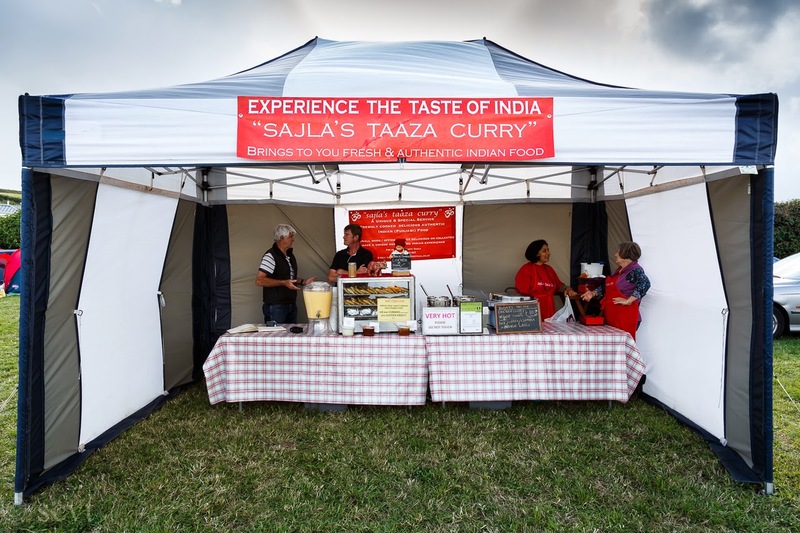 If you don’t book it, Sajla won’t make enough of it for you. Do be a hungry fool! Sajla’s Taaza Curry. Simply superb. As most of our customers know, Martial Arts Summer Camp is now in its sixth year. The first four years training was provided absolutely free of charge, with year five seeing the introduction of a small fee for training, and ad-hoc charges for additional creative-arts, first aid training, curry event and lantern making. This year we want to offer an improved service, and ideally, try and turn the business away from being a loss-maker for the organisers and teachers alike. I don’t think anyone would disagree that our excellent teaching staff deserve more than the minimum wage. Food for thought. At MACAW we understand that a lot of students are primarily attending for the martial arts, and that traditionally, martial arts clubs scrape a living by charging cheap for medium – large numbers. We also acknowledge that there is disparity in payments between martial arts instructors and creative arts instructors, for no appreciable reason. To help close the gap, this year we are introducing the red envelope system for paying for martial arts instruction and for making contributions to the cost of the marquee insurance . The night before you leave, please endeavour to pay a sensible and fair fee to the instructors of your classes by placing your payments in a red envelope with the instructor’s name on. Red envelopes and receptacles for the same will be provided, and allow for anonymous donations. At the end of the week, MACAW staff will decide if the system is sustainable, or whether we will need to swap to a fixed rate system, which will inevitably exclude some students. Please help keep MACAW running by supporting its staff. Two marquees mean that we can train whatever the weather. How good is that? Furthermore, if you fancy an alternative to training, try some art. Let’s have another massively successful camp. 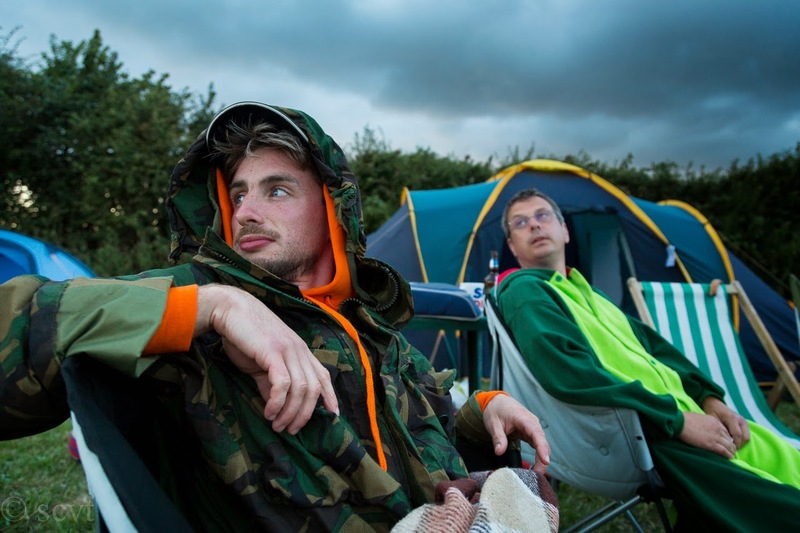 This year we want to encourage the general public in the campsite to join in a bit more and to spread the word. We have a great success story – last year saw Chris Chant (below, with Marcie) attend his first camp, and on the strength of his experience – that you helped give – joined a local karate-jutsu club and is about to take his 8th kyu exam. Congratulations Chris, that’s the embodiment of MACAW. Karateka Chris and daughter Marcie. Chris now trains at Doryoku Ryu Karate Jutsu in Plymouth. 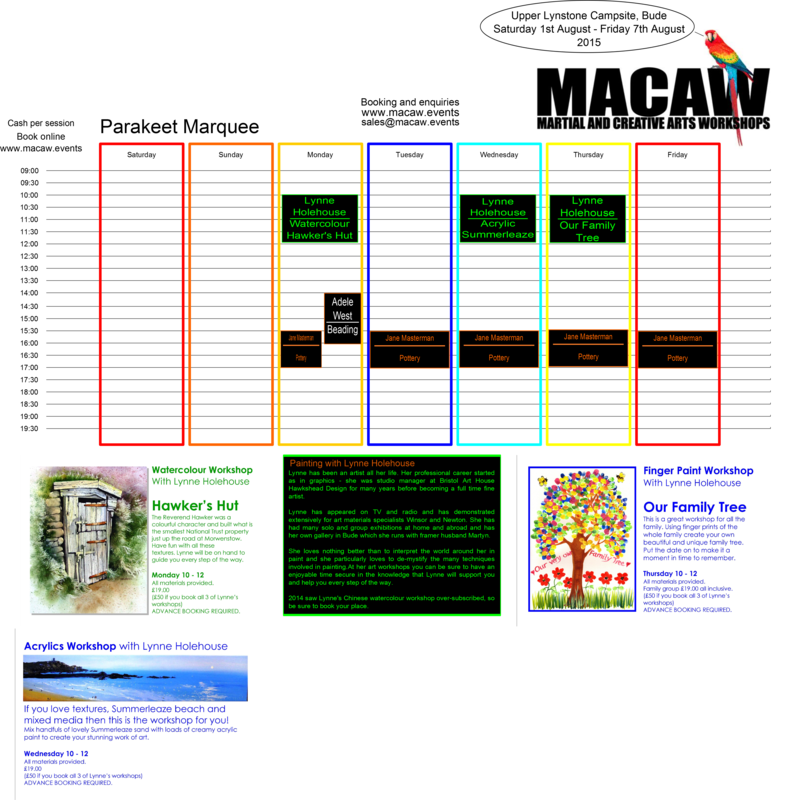 Its very likely that this year will see the start of MACAW hitting the festival circuit. That being the case, you can fully expect more of this sort of mayhem. MACAW will also be offering a range of branded clothing featuring our beautiful macaw logo embroidered on hoodies, teeshirts, polo shirts, rugby shirts etc. This entry was posted in Macaw, Martial Arts and tagged Alex Grange, david thomas, Jason King, Liam Grange, Lynne Holehouse, MACAW 2015, martial and creative arts workshops, martial arts summer camp, MASC 2015, sajla taaza curry, seventh wave gallery on February 19, 2015 by Jase.